Artis – Museums with green space. Located in the quiet Plantage area of the city, this remarkable complex is home to Amsterdam’s zoo, planetarium, and aquarium, as well as Geologisch Museum and Hortus Botanicus which is actually in Werthheim Park section. Artis, Plantage Kerklaan 38-40, Amsterdam. Tel: 0900 278 4796. Amstelpark – Great picnic space. This large park, in the community of Buitenveldert southwest of the city, spouts a picturesque rose garden, rhododendron walk, and a model garden. During the warmer months this is the spot for mini golf, pony rides, and a miniature train. Throughout the year exhibits of art are featured in the Glass House and the Papillon Gallery. Off Europaboulevard, Amsterdam. Amsterdamse Bos – A woodland park. This man made green space created in the 1930s now spans more than 2000 acres and includes woodlands, meadows, marshy areas, lakes, waterways, a goat farm, and botanical garden. During the summer months there is also a popular open-air theatre. Amstelveenseweg, Amsterdam. Theatre telephone +31 252 643 3286 or visit bostheater. Hortus Botanicus Amsterdam – Gardens and butterflies. Located in Werthheim Park within the Artis complex, this delightful location houses one of the largest plant collections in the world. The Palm House is not to be missed and the butterfly retreat is enchanting. Hortus, Plantage Middenlaan 2, Amsterdam. Tel: +31 252 625 8411. 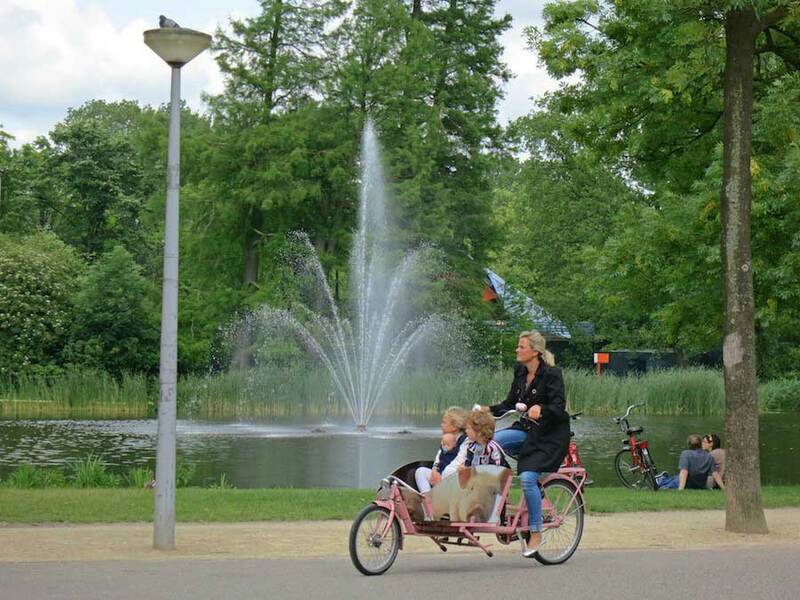 Vondelpark – Holland’s most popular park. Welcoming a staggering ten million admirers per year, Amsterdam’s primary green space is conveniently located on the edge of the capital’s central core, making it easily accessible for visitors. Comprising of 120 acres of sprawling verges, beautifully manicured gardens, abundant wildlife and a series of picturesque lakes, this pictorial setting grants a relaxing escape from the congestion of the city and constantly bustles with jovial activity, particularly during the warm summer months. The Vondelpark is also home to a quaint selection of charming cafes, including the delightful Blue Teahouse that dates back to the 1930s, a handful of children’s playgrounds, a skate hire facility, and an open air theatre that showcases exquisite performances of dance, music and theatre between June at September. Visit openluchttheater for more details. Vondelpark, Oud Zuid, Amsterdam. Keukenhof Gardens – Dutch bulb grower’s showcase. Located in the middle of the bulb fields, which span from Haarlem to Leiden, Kuekenhof Gardens is a spectacular showcase for millions of bulbs. The 74 acres flower garden, probably the largest in the whole world, is themed each year to provide visitors with a visual WOW! The woodland gardens showcase daffodils, narcissus, hyacinths, tulips, and lilies under flowering cherry blossoms or along with azaleas and rhododendrons. From January to mid May the area presents its best blooms and celebrates with annual flower parades to conclude the season. Keukenhof, Stationsweg, Lisse Netherlands. Tel: +31 252 465 555. Frankendael Park – Amsterdam’s single remaining 17th century country estate. Located in the south of the city close to Amstel Station, this romantic refuge mercifully evades the tourist masses, boasting two historical gardens, aptly titled Style and Landscape, a sunbathing and picnic area, the exceptional De Kas restaurant and of course the park’s namesake, Frankendael House. Through countless renovations, this monumental structure has successfully retained its authentic character, and is guarded by two 18th century sculptures of Roman gods, Bacchus and Ceres. Guided tours offering an exclusive insight behind the scenes of this stunning building are available every Sunday morning. (Tuinbouwstraat 66, Oost en Watergraafsmeer. Visit the website. Westerpark – cherished by locals and adored by tourists fortunate enough to encounter this beautiful natural expanse, the Westerpark not only offers picturesque landscapes but is also regarded as one of the premier cultural venues of Amsterdam. Constructed upon a former gas factory, this sublime setting measures an immense 35 acres, hosts a superlative series of events, including festivals, exhibitions, fun fairs and markets, and comprises of a wonderful array of cafes, clubs, stores, sports facilities, children’s playgrounds, a petting zoo, and a delightfully unique cinema showcasing independent film. Indulge in a sociable picnic in the vibrant atmosphere around the lake or delve further to discover tranquil walking paths and untamed natural beauty. Polonceaukade 27, Amsterdam West. Tel: +31 205 860 710 or visit online. Oosterpark – Amsterdam’s original public park. Created in 1891 in the style of an English garden, this scenic space can be found in the east of the capital next to the superb Tropenmuseum, granting respite from the congestion of the city and an idyllic setting for a leisurely stroll, bike ride or even an afternoon of sunbathing. Featuring ample grassy verges, flowing water, plentiful wildlife, including striking green parrots, and several significant monuments and sculptures, the Oosterpark is a joy to visit and also hosts an impressive collection of events and festivals, such as Appelsap, Keti Koti, and the beloved Roots Festival that delights the crowds with exemplary musical talent from all four corners of the globe. Oosterpark 72, Watergraafsmeer. Tel: +31 202 018 800. Note: This information was accurate at time of posting. Please be sure to confirm details before planning your trip.